Let’s hear your thoughts, and don’t forget to send us your ticket stubs and flyers too! The Custard Factory, Midlands Art Centre, The Jam House, Adrian Boult Hall… the list is long. 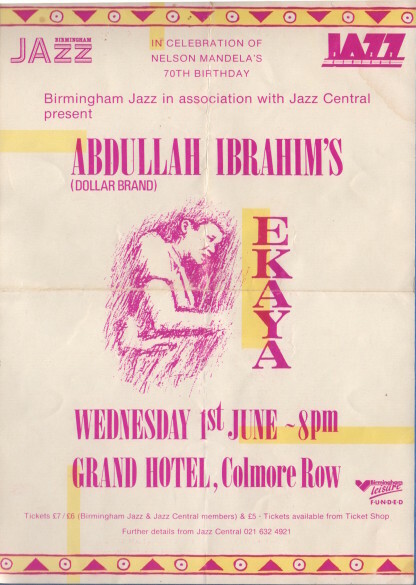 “I founded Birmingham Jazz in 1976 with the help of six other enthusiasts; we each put £25 on my dining room table and said we would promote some concerts for as long as the money held out. Birmingham Jazz has promoted live jazz ever since – a remarkable achievement. 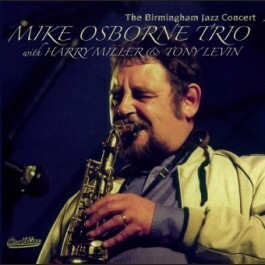 Our first concert was with Barbara Thompson’s Paraphernalia; I’m not sure who were our second but Mike Osborne’s trio with Harry Miller and Tony Levin was the third, on 7 November 1976. These concerts took place in the Warwick Suite of the Grand Hotel, Colmore Row, Birmingham that was our home base for the first five years. The musicians gave me permission to record the concert as a souvenir on my Maxwell C180 tape and Yamaha recorder, and it subsequently remained unplayed in my files until unearthed in 2009; amazingly the tape had not deteriorated in any way and gives a very high quality documentation of an outstanding evening’s music making. 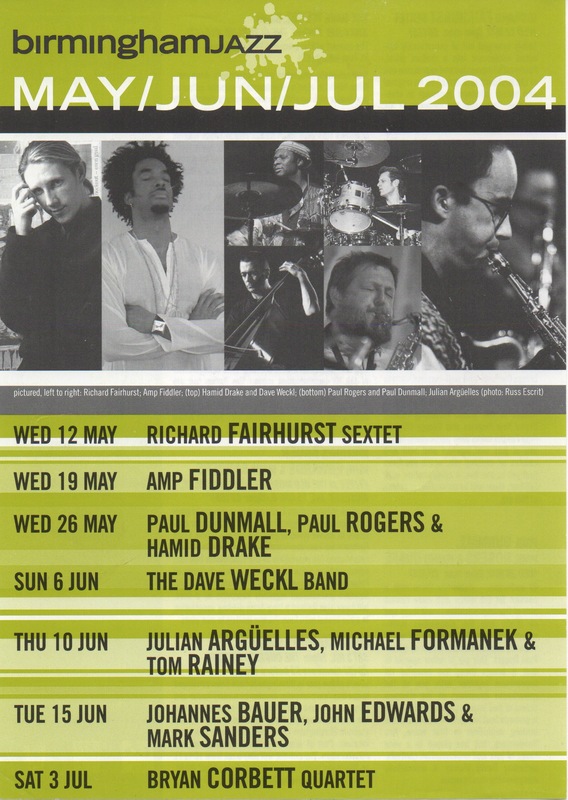 Birmingham Jazz is a promoting organisation which presents contemporary jazz in the city on a year-round basis. A limited company with a nine-strong board of directors, Birmingham Jazz was formed in 1976 and is funded annually by Birmingham City Council, West Midlands Arts and The Musicians’ Union. It has also been awarded grants from the Lottery and Touring Departments of Arts Council of England, and, more recently, under the Regional Arts Lottery Programme. In 1999 it won an award under the Jazz Promoter Scheme run by PRS and Jazz Services. It has in the past also received a grant from the Foundation for Sport and the Arts. The company employs no paid staff, but special projects are managed on a free-lance, consultancy basis. Birmingham Jazz promotes between 30 and 35 major concerts per year, in the CBSO Centre in Berkley Street off Broad Street (capacity 300), the mac (Midlands Arts Centre) (capacity 200) and the Adrian Boult Hall (capacity 500). It has also promoted at The Drum, The Custard Factory and the Sanctuary Night Club. In addition, local musicians are featured in regular weekly sessions at the Strathallan Hotel. These take place at Sunday lunchtime and are funded by the hotel itself and the Musicians’ Union. A recent development has been a commuter jazz programme run from 5pm to 7pm on Friday evenings at the Fiddle & Bone pub; that bands that play at these sessions are all based in Birmingham and the West Midlands. Birmingham Jazz is a promoting organisation which presents contemporary jazz in the city on a year-round basis. A limited company with a nine-strong board of directors, Birmingham Jazz was formed in 1976 and is funded annually by West Midlands Arts, Birmingham City Council and The Musicians’ Union. It has also been awarded grants from the Lottery and Touring Departments of Arts Council of England, and more recently from the Regional Arts Lottery Programme run by West Midlands Arts. It won an award under the Jazz Promoter Scheme run by the PRS and Jazz Services in 1999 and 2001, and had a grant from the Foundation for Sports and Arts in 1996. The company employs no paid staff, but special projects are managed on a free-lance, consultancy basis. It is, however, to employ a part-time administrator in 2002. Birmingham Jazz promotes up to 30 to 35 concerts a year in various venues around the city. These are the CBSO Centre (capacity 300), the mac (Midland Arts Centre: Capacity 200),the Adrian Boult Hall (capacity 500) and The Glee Club (capacity 400) a new venue to be tried out in the autumn. It has also promoted at The Drum, The Custard Factory and the Sanctuary Night Club. In addition, local musicians are featured in regular weekly sessions at the Fiddle and Bone pub. These sessions take place at Sunday lunchtime and are funded by the pub itself and the Musicians’ Union. A recent development has been a commuter jazz programme featuring local bands run in short seasons (not every week) from 5pm to 7pm at the Fiddle and Bone pub. Birmingham Jazz believes strongly in the development of contemporary jazz and new work. It taked a broad definition of ‘jazz’ and is interested in collaborative projects that draw on other musics. This does not mean that older styles of jazz are neglected. In addition to the promotion of one-off concerts, Birmingham Jazz is increasingly pursuing the development of a diverse range of specially commissioned projects. 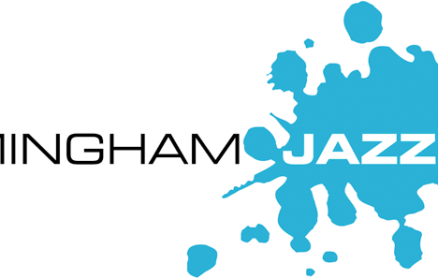 In the last twelve years this has become a very important and exciting part of Birmingham Jazz’s activity and the society has moved towards becoming more of a `producing’ organisation than a `receiving’ organisation. These projects have either been in the area of contemporary jazz or in collaborative projects with other styles of music or other artforms, notably dance. A weekend devoted to the music of Mike Gibbs, a leading jazz composer (1989). A week’s residency for Cuban trumpeter Arturo Sandoval to work with the Birmingham based Latin Jazz group Como No (1992). The Twin Cities Octet which involved the creation of a jazz octet with two players from each of the twin cities of Birmingham, Frankfurt, Lyon and Milan. This also involved commissioning the leader of the octet Giorgio Gaslini (from Milan) to write a suite for the octet (1992). The Bimhuis Project in which leading bands from the lively Dutch jazz scene appeared in Birmingham as part of the European Arts Festival (1992). The commissioning of the British composer/pianist Julian Joseph to write an extended piece entitled Winds of Change for his Forum Project band. As well being premiered in Birmingham, the project toured nationally and is likely to be recorded. This was funded by the Prudential Award. The commissioning of Dutch pianist Michiel Braam to write arrangements of Lennie Tristano pieces and a new work in the spirit of Tristano’s music performed in Amsterdam, and in Birmingham as part of the Towards The Millennium 40s Festival. This was broadcast on Dutch National Radio. The project was repeated as part of the 90s Festival in year 2000. The initial planning of the creation of a UK/New York version of Wayne Horvitz’s New York Composers’ Orchestra. This appeared in Birmingham in May 1995 and toured nationally on the CMN. The London concert was broadcast on Radio Three. The commissioning of Iain Ballamy to write a piece for the Apollo Saxophone Quartet and his new quartet Acme. This has now been recorded for the B+W Music label. The commissioning of Tom Bancroft to write an extended work for his Big Band. This was toured nationally and the London concert broadcast on Radio Three. The commissioning of David Murray to write new big band music for the CMN tour of his UK/USA Big Band. The London concert will be broadcast on Radio Three. The commissioning of Barbara Thompson, JulianJoseph, Dave O’Higgins and Albert Mangelsdorff to write or arrange pieces for a special sextet formed for a 20th anniversary concert. The concert was recorded for broadcast on Radio Three. The commissioning of Clark Tracey to arrange Tubby Hayes’s big band pieces for the first performance of the Tubby Hayes Legacy Orchestra. The commissioning of Iain Ballamy to write music for the dance piece Oblique choreographed by Ranjabati Sircar. Co-commissioning with BCMG the American composer David Lang to write The Passing Measures for Marty Ehrlich and BCMG. The commissioning of Billy Jenkins to prepare improvisations for shorts by Norman McClaren and the play station game Tomb Raider, and Huw Warren to write a score for the silent film classic Steamboat Bill Jnr featuring Buster Keaton. The commissioning of Julian Arguelles to write 50 minutes of new music for his octet to be performed as part of a short tour, and to write a 10-minute piece for the Apollo Saxophone Quartet. The latter was co-commissioned with Blackheath Concert Halls. The commissioning of Billy Jenkins to write a piece for six drummers to be performed as part of a club. This piece The Drum Machine Plays the Battle March of Consumerism was premiered at The Sanctuary Night Club in May and also featured during ArtsFest 2000. Four commissions for Bobby Previte, Mark Lockheart, Dave Pattman and Gerard Presencer as part of the Forward Festival. A percussion piece by American drummer Peter Erskine for the Birmingham-based Afro-Caribbean dance theatre company Kokuma. This was choreographed by Kokuma’s artistic director, Jackie Guy, for a performance in 1991 and an extended version became their main touring production in 1992/93. The music was subsequently recorded on the American Interworld label. A commission for Mike Gibbs to write Bloods of Dust, a piece for American jazz guitarist, Bill Frisell and Birmingham Contemporary Music Group (1992). This piece received its second performance in October 1995 as part of The Series. An extract of the piece is on an Unknown Public CD. The orchestration of several pieces by Mark-Anthony Turnage by Mike Gibbs for the Creative Jazz Orchestra (1994).This was toured nationally on the CMN and the London concert broadcast on Radio Three.